World Muaythai Council » World Muaythai Angels Final! 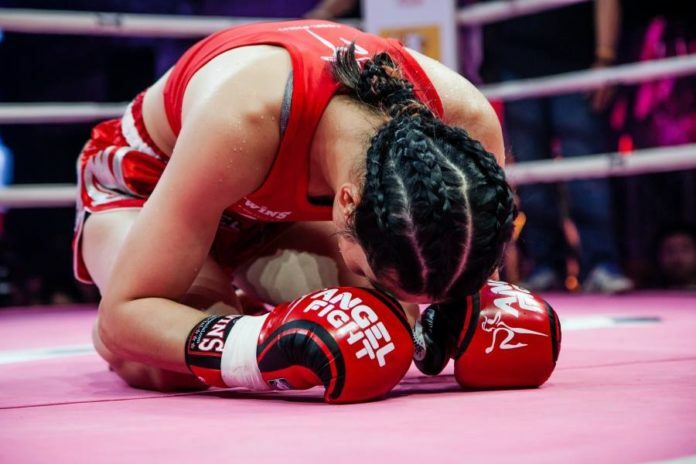 Following a massive success with round 2 of World Muaythai Angels at the U-Tapao International Airport, Thailand, the semi-final and final rounds are set to take place on Saturday December the 16th this time in the Sports Authority of Thailand. The competition which is sanctioned by the WMC is a sixteen-woman elimination tournament at 57kg which began in April. Due to complications some fighters were not able to continue in the tournament so the organisers have merged the semi-final and the final into a Super 4 competition. The competition has featured many IFMA and WMC superstars for example Sofia Oloffson the WMC European Champion,WMC World champion as well as World Games athlete of the year who was in the earlier stages of the competition. Also on the bill is Chomannee and Yolanda Schmidt both WMC and IFMA superstars. The first round of the Super 4 will see Namtarn Por Muangpetch (Thailand) go head to head with Chommanee Sor Tehiran (Thailand) and Yolanda Schmidt (Australia) face Natalie Morgan (USA). The event will be held at the Sports Authority of Thailand, starting at 6pm and will be telecast live on the Thai Rath Channel. From all at the WMC we wish all of the athletes the best of luck and may the best woman win! This entry was posted on Wednesday, December 13th, 2017 at 12:50 PM	and is filed under News.